Most of us are well aware of the benefits of drinking water, especially when it comes to anti-aging. But did you know that it is equally important to keep the moisture locked into our skin? That’s where a daily moisturizer comes in. This one simple ritual has the ability to completely transform our skin, preventing de-hydration and all of its effects – dryness, flakes, and even wrinkles – both today and as we age. Moisturizers prevent water loss when our skin is exposed to dehydrating elements – like the sun, heat, and wind – through ingredients called occlusives. They also attract water to the skin through ingredients called humectants. Together, these ingredients keep our skin hydrated, which enables it to function at its peak and continuously repair and replenish itself with new, fresh cells. The end result? A healthier, more youthful complexion both short term and long term, with fewer wrinkles and fine lines developing as time goes on. Getting started with a moisturizing routine before your 30’s (when dryness increases and skin’s natural repair system weakens) only gives you a head start. The trick is in finding the right moisturizer. But not all moisturizers are created equal. Many of us (myself included) spend loads of time researching, reading reviews, and experimenting with different products, only to find that they don’t always perform on the level we expect (sometimes even the pricier options). If you’re still in moisturizer limbo, or looking to make a change, there’s one stand-out cream to consider. It comes from a long-time, worldwide leader in skincare, and is not only clinically proven to deliver intense hydration with visible results, but also incredibly affordable. Olay’s new Regenerist Micro-Sculpting Cream is designed to be so moisture-intensive and hydrating that it provides visible results starting on day one. Formulated with a powerhouse of moisture-boosting ingredients like Hyaluronic Acid, Amino-Peptides, Panthenol (Vitamin B5) and Niacinamide (Vitamin B3), combined with olivem (a derivative of olive oil), Olay Regenerist delivers moisturizing ingredients 10 layers deep into the skin’s surface. This surge of hydration instantly plumps, firms, and softens skin. Olay’s latest ingredient, Carob Seed Extract, further encourages skin repair and regeneration, making one high-performing cream that packs long-lasting moisturization plus extra anti-aging benefits. In fact, the Olay Regenerist Micro-Sculpting Cream most impressively beats out even top department store creams when it comes to moisturizing! In an independent study by Good Housekeeping Institute, GHI’s engineers, scientists and other experts rigorously tested and evaluated Olay’s cream against different high-end creams in areas ranging from performance to safety. After collecting more than 10,000 hydration measurements, GHI found that Olay Regenerist Micro-Sculpting Cream outperforms 10 prestige creams, with price points from $26 all the way to $440. At the three-hour mark, it was found to moisturize 400% better than the cream priced at ~$440, and beat out all of the other products tested. The kicker? Olay’s Regenerist cream is at the lowest end of the price range, coming in at only $26.99 (USD) per jar. Nearing my 30’s, I’ve been experimenting with quite a few multi-tasking moisturizers. I have combination skin, so it’s always a bit of a struggle to find a balance between dryness and oiliness. My ideal moisturizer has to intensely hydrate but can’t be too thick/heavy on my oily areas – a rarity to find. Olay’s surprisingly does just that. Lately, I’ve been using the Olay Regenerist Micro-Sculpting Cream in the mornings before applying makeup (leaving about 20 minutes in between to let it work its magic), as well as after my nighttime cleansing routine. Almost instantly, the moisturizer feeds my skin with intense hydration, noticeably plumping, brightening, and adding an all-around youthful glow to my skin. The cream itself is luxurious and rich, yet feels lightweight on the skin and quickly absorbs without any oily or greasy residue. In the end, it leaves my combination skin feeling comfortable, balanced, and completely hydrated – all day (and night) long. The right-hand photo was taken just one day after my first two applications of the Olay Regenerist Micro-Sculpting Cream (I applied both morning and evening). In just 24 hours, the cream noticeably improved the texture of my skin, giving it a smooth, soft-focus finish. The moisture surge also helped to balance out my oily cheeks and T-zone and reduce a lot of the shine, even as the day went on. Here’s a photo of my eye area (my biggest trouble spot when it comes to dryness and fine lines), taken after 3 days of using the cream. You can see that my skin is less oily, much smoother, and the fine lines around my eyes aren’t as deeply set. If the cream can make that much of a difference in so short of a time, I can only imagine what it could do with continued use! If you too are on the market for an intensely hydrating, multi-tasking moisturizer to add to your skincare routine, treat yourself (and your wallet) to a jar of the Regenerist Micro-Sculpting Cream. Swap it out with both your daily and nightly moisturizer, and you’ll be on your way to more hydrated, healthy-looking skin today and years to come. 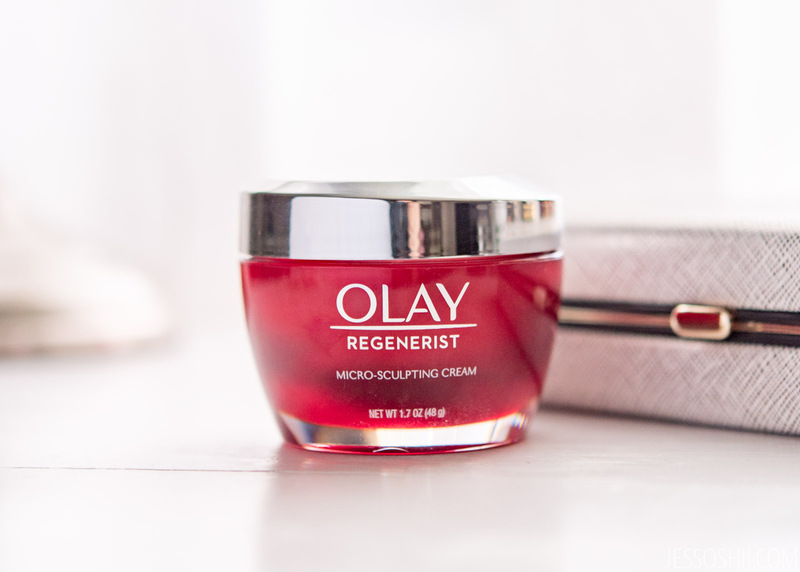 Have you tried the Olay Regenerist Micro-Sculpting Cream?